Now that I have finished my Baby Starghan for my little boy, I've started crocheting a blanket for my friend's second baby boy, who is due about two weeks before I am. She really liked the one I made for the little bun, but I really, really, really don't want to make another one so soon after finishing that one. I rarely do big projects, so those last three rows were eternity for me, I was sooooo done. So, I figured that I'd make her a blanket in the same color scheme, but a different pattern. Enter the basic granny square! I figured that I'd share how to crochet a nice, easy, traditional granny square. I've seen it done a slightly different way, but this is my preferred method. Please, bear with me, this is the first time I've ever written up a pattern! FOUNDATION CHAIN: ch 4; join with a sl st into 1st ch to form a ring. ROUND 1: (ch 3, 2 dc, ch 1) in same space (3 dc, ch 1) 3 times; sl st to top of first ch3 to finish round. From here, you can either cut change colors, like I did, or you can continue with the same color. To change colors, cut your yarn and pull the tail through the sl st to secure it, then draw a new color of yarn through a ch stitch. If you are keeping the same color, just continue on the the next round. ROUND 2: (ch 3, 2 dc, ch 1) in same space (in next space, 3 dc, ch 1, 3 dc) 3 times; 3 dc, ch 1 in next space (next to starting ch3), sl st to top of first ch3 to finish round. To change colors, cut your yarn and pull the tail through the sl st to secure it, then draw a new color of yarn through a ch stitch. To keep the same color, sl st your way to a corner, and continue to the next round. ROUND 3: (ch 3, 2 dc, ch 1) in same corner space *3 dc in each space between corners of square; in corner space - 3 dc, ch 1, 3 dc. * Rep from * to * 3 times. (3 dc, ch 1) in next sp (next to starting ch-3), sl st to top of first ch3 to finish round. ROUND 4: Pretty much repeat round 3, then cut your yarn and pull through the last sl st, weave in your end. You can also leave it really long for sewing it to other granny squares. Hope that was clear enough! If you have any questions, feel free to ask. I'll help any way that I can. 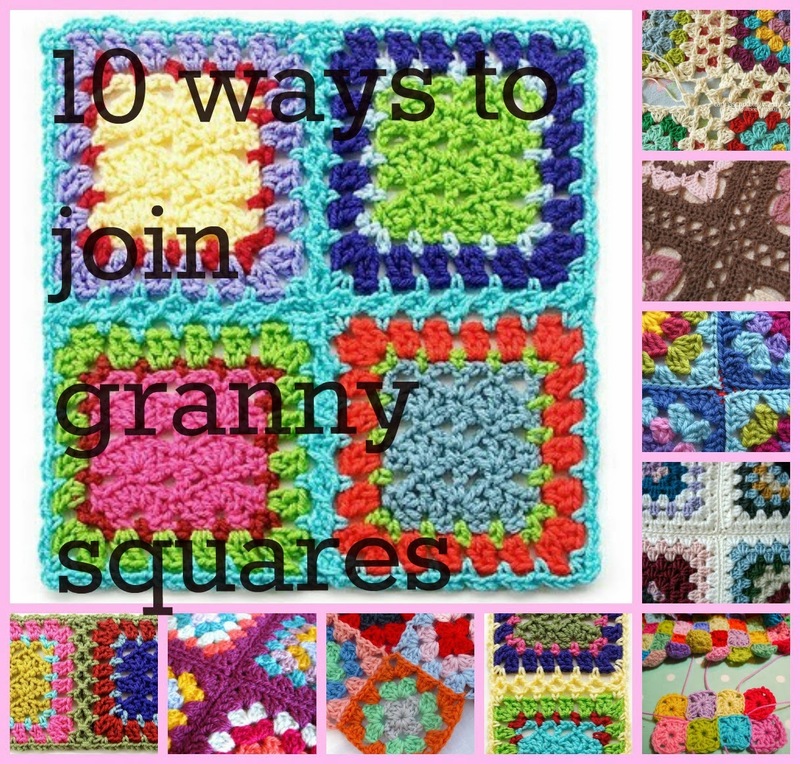 For some great ways on how to join your granny squares together, check out Knot Your Nanas Crochet's great roundup of 10 Different Ways to Join Granny Squares. When it comes to granny squares, you can make a ton of different things from them- blankets or afghans, scarves, tote bags, and so much more! 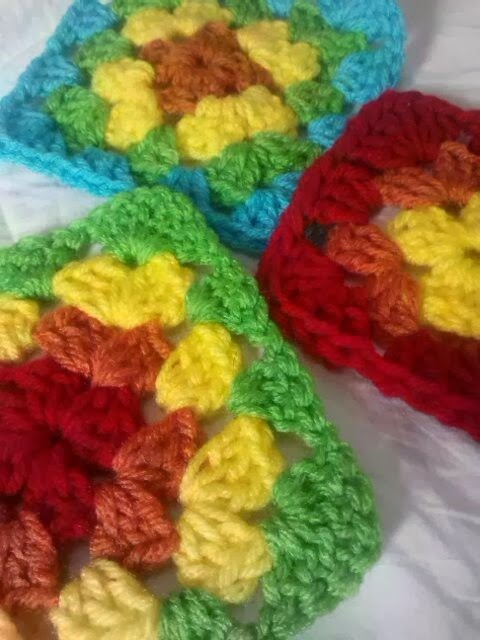 Let me know what you make, I'd love to see your granny square projects.